Bananas are a good snack for your body and muscles. Storing bananas properly will allow them to ripen and prevent bruising. This is a guide about storing bananas. 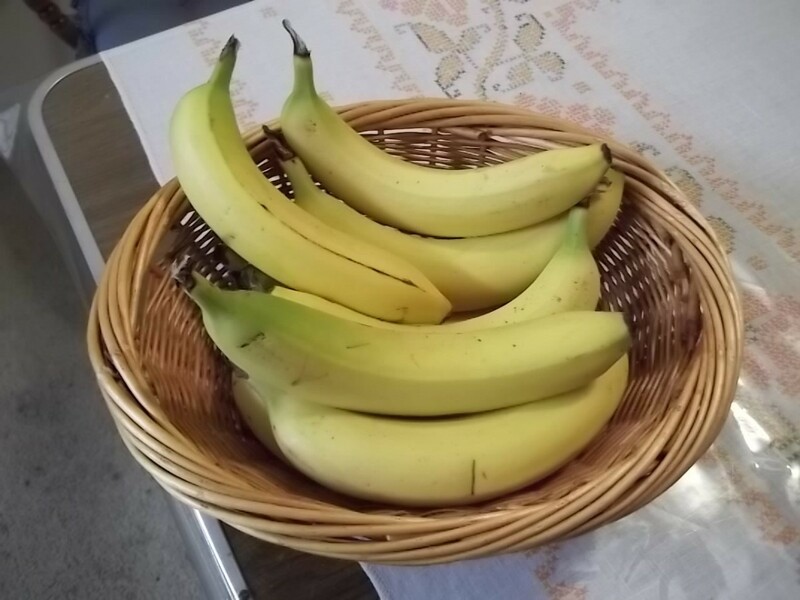 When you get home from grocery shopping, separate all the bananas from the bunch and place in a bowl or basket. By doing this, it will slow down the ripening process. I've noticed by the end of the week, they will start getting brown spots. Bananas will last much longer if you store them in the refrigerator. They also taste sweeter! Just pick the bananas in the store that are ripe to the point you want them, leave them in the plastic bag, and put them in the refrigerator. The peel WILL turn dark brown, as if they are way over-ripe. Don't let this discourage you, as you will discover when you peel the banana, it is still firm and even sweeter than those kept on your counter. My mom has used this method for years. I didn't believe her, until I tried one of her bananas that had been in the fridge for a week. My family refuses to eat bananas after they get any brown spots (they want some green still on them), and in warm weather they turn brown really fast. They get those annoying little gnats swarming around them! It took some work to convince my skeptical husband and kids that just because the peel is brown, it doesn't mean the banana is going to be mushy. Once they got past the look, they love cold bananas as much as I do! If you put your bananas in a plastic grocery bag, in the bottom crisper drawer of your refrigerator, they will keep for about a week before turning black. If you wrap the stems of bananas with cling wrap, they will not turn brown so fast. I have posted this in the past, but I will add it to this grouping. If you put your bananas in a brown plastic grocery bag and a clear or white plastic grocery bag in the refrigerator, they stay fresh much longer. I thought about that cute banana hanger that our daughter has on her counter. I don't have room for one but I found a place to hang the bananas. 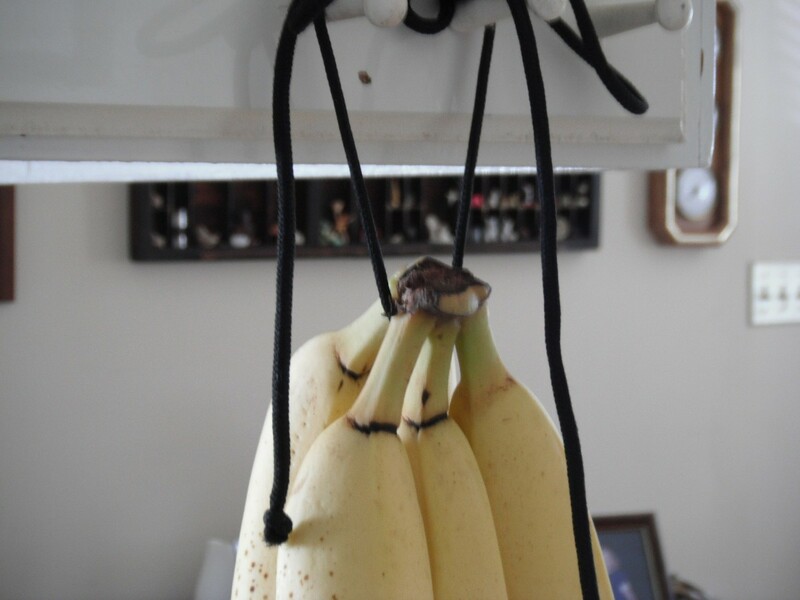 Using a shoe string, I hung the bananas at the end of the kitchen cabinet. When buying bananas, buy the green ones. Put them in the fridge in a brown paper bag. Make sure you take them apart one by one. No need to buy green bags, this works much better and adds the shelf life. To keep bananas fresh for a few days longer, wrap a piece of plastic wrap on the stem of the bunch. 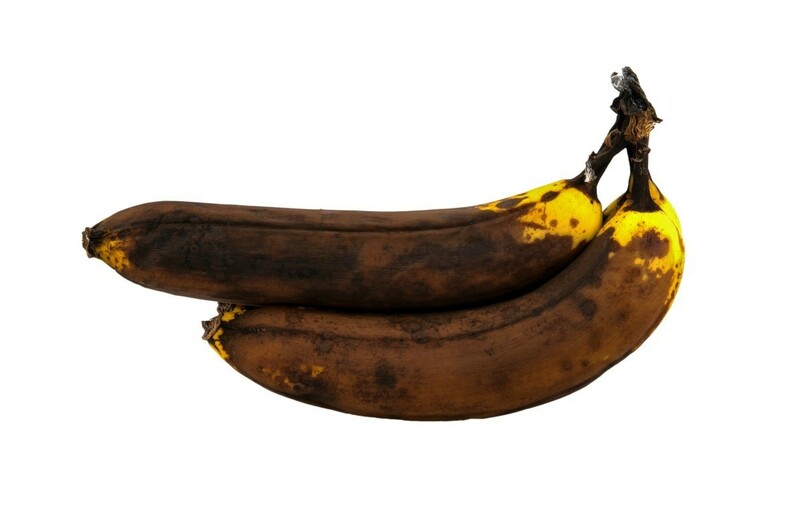 Sometimes, bananas can ripen too fast, with the yellow skins turning spotted then dark. This guide has tips for keeping bananas from turning black. 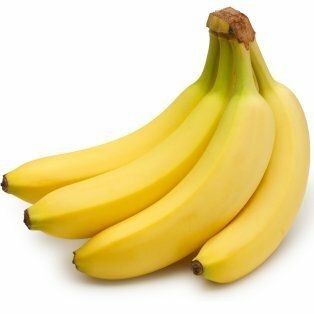 Bananas browning too quickly? Place bananas in a brown bag, set in the refrigerator. The skins will turn brown in a few days, but the fruit will be beautifully white and firm.